Pete Sampras Tennis (Sega Genesis, 1994) - Cartridge Only! 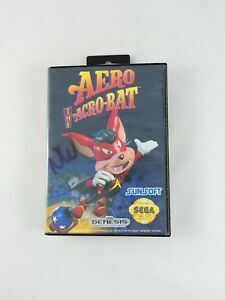 Aero the Acrobat (Sega Genesis, 1993) Tested, Works Great! DJ Boy (Sega Genesis) - Cartridge Only! Objectives change across the many levels, and require Aero to jump through a succession of hoops or ride in log-flumes, roller coasters, and the like, while avoiding obstacles and jumping chasms. At the conclusion of certain environments Aero will face a giant boss character, whom he must defeat to continue onwards. The game and graphics were Great is juat the music sound went out in mid game not sure what happend it just made a loud fuzzy noises like a lost signal. But overall it still works and can just mute it when that happens. this game i cant put down its sooo much fun to play. would be a recommended game for anyone. you should buy this game!